Unless specified otherwise, Popco ships via FedEx ground from the Minneapolis area, FOB our dock. 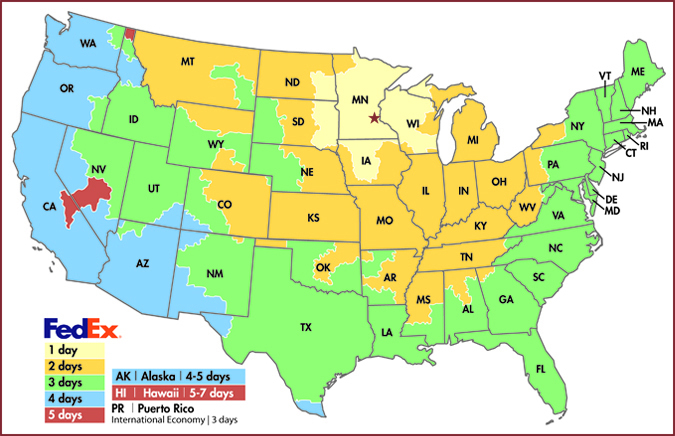 FedEx ground shipment requires one to five days in the continental US. 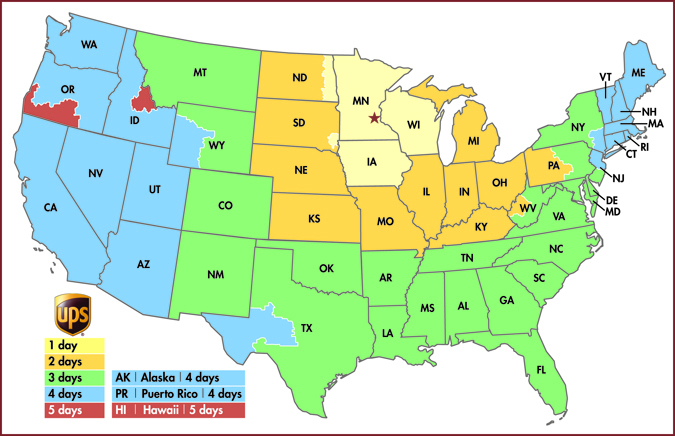 Shipments to Hawaii require five to seven days, and shipments to Puerto Rico require three days using International Economy service. See the FedEx ground-zone map below for transit times to your area. Most orders, placed no later than 1:00 p.m. central time, will ship the same day. Exceptions to same-day shipments are orders that require customization such as cutting, assembly, or kitting. UPS shipping is also offered and is most often used when shipping on our customer's accounts. The UPS ground-zone map below details transit times to your area. If ground shipping isn't fast enough for your project, both FedEx and UPS expedited shipping is offered. Please be aware that the cost for expedited shipping is substantially higher than ground shipping. To illustrate cost differences, we've estimated shipping from Minnesota to the east and west coasts, and listed approximate costs for a variety of weights and shipping services. Large, multi-package orders are best shipped by truck. For these shipments, Popco's default method is FedEx freight. We can also prepare shipments to be picked up by your carrier. For details on these types of shipments, please contact a Popco sales representative. In the Minneapolis/St. Paul area, courier shipments are an option. Often, for large and heavy orders, courier shipments to our twin cities customers are more cost-effective than FedEx or UPS. Local customers can also arrange to have their drivers pick up packages at Popco. Small packages are picked up at our reception office and large packages or skids can be picked up at our dock. Popco offers drop shipping; a charge of $5.00 per destination applies to orders sent to more than one location. Additional charges may apply if special packaging is required. We can also drop ship blind, using your label in a plain box. We do this frequently and confidentially. Popco's line of products is diverse; some of our products are very small, others are large. Some products are quite light and others are very heavy. Additionally, it is not uncommon for products with dramatically different sizes and weights to be combined in a single order. Because of this, we determine shipping costs by packing and weighing each order, then we add the applicable FedEx or UPS charge to the order. We do not profit from shipping. Instead, we charge just what is required to ship your package. Also, because of the volume of packages that we ship, we have attractive rates with FedEx and UPS, and we pass the resulting savings on to you.